Lowdermilk beach is a beachfront park in Naples Florida. It's a great place with lots of amenities for everyone, like beach volleyball and a children's playground. There are picnic tables all over the park... Under the trees, with views of the water, and underneath the covered concession stand area. Yes--there's a concession stand too! Plus there are two gazebos... One is on the north and the other on the south end of the park. This is a great for the whole family and large groups. 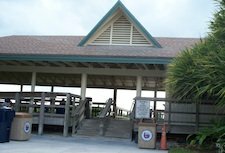 The park offers restrooms, outdoor showers to rinse off, and has metered and unmetered parking spaces. Try to get here before 10 am during seasonal months so you don't have to look for parking. To rent a gazebo you can call 239-417-0777. 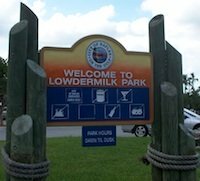 Visit the cities' Lowdermilk Beach website for details on pricing.